MONDAYS WITH MAITABI: SHE’S BOSSY! I hear this quite often about my little one. And, I don’t deny. She is like that. She is bossy. She speaks her mind and makes sure that everyone hears what she says. She is talkative. Extremely inquisitive by nature, and by and large a no nonsense person. 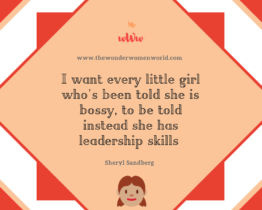 More than often we all talk about empowering our girls. Making them independent. Making them more aware of their surrounding. Encourage them to speak their mind and have their own ways of dealings with circumstances and situations. But do we really adhere to that? Do we in actually appreciate a more outgoing and vociferous girl? That’s because many of us still feel that a girl should be docile, unassuming, quiet and easily tamable. A girl should be listening to you. Approving. And, not voicing her opinion much. Sadly, still this is true. This is how we perceive girls. This is how we want them to grow. Somewhere deep down our psyche, we are conditioned that girls should be in binds. It is hugely important to understand that a girl cannot fly one fine day. The wings cannot be tripped and then restored later. A girl needs to be given an environment to bloom the way she wants to right from an early age. Think and condition her personality in an unique way. And, then only there will be a day when she creates her own space in the world. With confidence. With conviction. I request, allow a girl to be what she is. Don’t judge. Don’t condition. She is born to fly. Let her. Give her the unending sky !